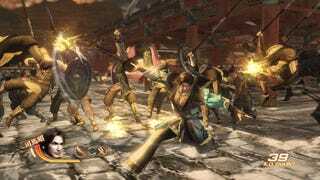 While it was once one of the most popular and well received series in gaming, Dynasty Warriors seems to receive more and more negative feedback with each iteration. This is not due to radical shifts in gameplay and/or tone—as many game sequels are accused of doing—but rather the exact opposite: Negative comments center around Tecmo Koei's insistence to stick to the formula that made it a well-known franchise. I'm not so sure, though, that this hate from gamers is justified. It's true there are certain things you can expect from a Dynasty Warriors title—namely slaughtering thousands of enemies in hand-to-hand combat. The gameplay cycle of Dynasty Warriors has been the same for over a decade: 1) lead your armies to a contested area, 2) kill "generals" in that immediate area to scatter their armies, and 3) repeat until no enemies remain. And of course, as the battle system and progression arc are the series' core game mechanics, all Dynasty Warriors titles play basically the same. So what changes if not the gameplay? The answer is "the setting." While the series often returns to its roots in the Chinese epic "Romance of the Three Kingdoms" the Dynasty Warriors formula has spread to other historical settings as well. Feudal Japan, Ancient Greece, and even the European Hundred Years War have been visited at least once. Moreover, this core gameplay has proven suitable for fictional worlds, as the most popular Dynasty Warriors games in recent memory have been adaptations of some of Japan's most famous anime. Whether it's giant robots, a man fighting across a post-apocalyptic wasteland, or a band of pirates adventuring across the seven seas, the Dynasty Warriors formula has been well suited to the task. So perhaps it is time to stop looking at Dynasty Warriors as a series that has gone stale and more as the epitome of a genre. While many great games from Bayonetta to God of War have been listed as part of the hack-and-slash genre, no game more denotes the idea of what it means to be hack-and-slash than Dynasty Warriors. And while it's perfectly acceptable to find hack-and-slash titles unappealing as a whole, criticizing Dynasty Warriors for just staying true to its hack-and-slash roots is like complaining that the Street Fighter series continues to be only about people punching and kicking each other in one-on-one fights. Dynasty Warriors should be judged by what kind of game it is aiming to be and whether it succeeds at that goal, not on some abstract concept of what a good game should be or the way in which video games should evolve.